a person who organizes concerts, plays, or operas. You don’t have to own a bar or a coffee shop to host great music. Have a living room? A garage? A yacht, a barn, shop or backyard? I can create a fabulous musical event for you and 15 or more of your friends. Thank you for your interest in hosting a house concert! In my experience as a performer, house concerts have been among the most fun, rewarding, and memorable concerts I’ve ever been a part of. I hope this will inspire you and get you excited for what is guaranteed to be one of the most unforgettable things you do all year. A house concert doesn’t even have to be in a house, though many of them are. They could be in living rooms, garages, backyards, and on back patios; in small houses, big houses, condos, and apartments; at a winery, in a photography studio, a tattoo shop, or at a local theater. The point is that the “house” can be any space you have access to where your friends can gather, sit, and enjoy a concert. The only requirement for the space is that everyone must be able to gather in the same space, seated, for the entirety of the hour long concert. A house concert is a lot like having a bunch of friends over for a dinner. Often times, the duration of the show from the start of the music is only 2-3 hours and I’ll make it really easy for you! Invite a bunch of your friends! In the sample invitations above I have provided you with some precise language that we’ll need you to include in your invitations; but besides that, I want you to have fun telling your friends why you want them to come to the awesome event you’re hosting. If you’d like to use one of the above invites I can fill in your show information and send it to you as a PDF to print out as mailers, and as a .jpg to send out digitally. You are also welcome to come up with one of your own. It’s really important to me that I’m able to make it so these concerts are possible for anyone to host, and the way I do that is by doing the shows on a donation basis. But since the donations are how I earn a living and pay my expenses, it’s important that I have my host’s full enthusiasm behind that aspect of the event. I’m pretty good at helping hosts on the donation speech, and I will make a point of going over this with you as we’re getting set up on the day of the concert. So you’ve invited everyone, RSVPs are in, and you’re ready for the show – here’s how it goes down! I will arrive about half an hour before guests are scheduled to start arriving, in order to set up my equipment and do a soundcheck. Guests arrive and then, after an hour of pre-concert hanging out, everyone gathers in the performance space, people find their seats, the host gives a brief introduction, and then I perform for about an hour. After that, we all hang out some more until the guests start heading home. House concerts are amazing and magical experiences that make fantastic memories and lasting friendships. I can’t wait to do a house concert with you. All of us were blown away at the backyard concert I hosted. Randy’s expert playing was amazing. He obviously gets as much enjoyment playing as we did listening. Classical guitar playing is not usually my first choice, but definitely a fan now. Fantastic! 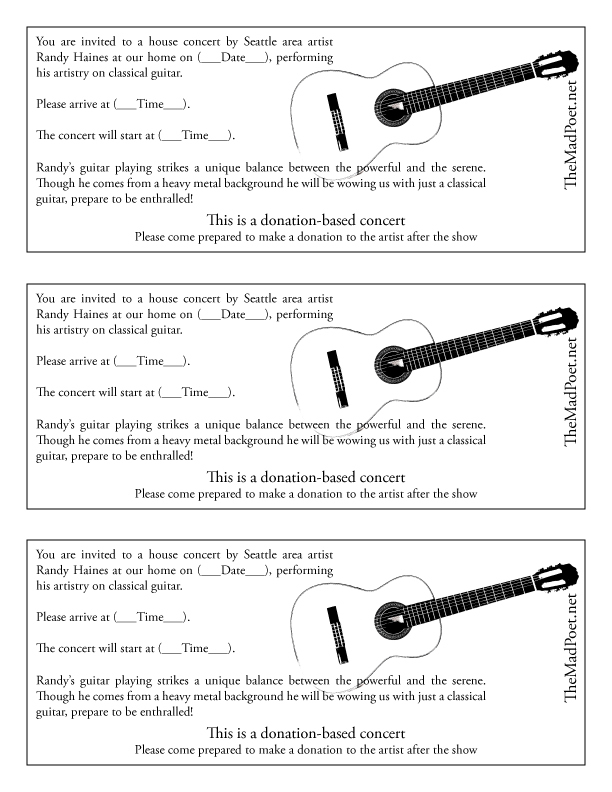 We had a house concert at our home with Randy performing a variety of music, it was a great time for all. 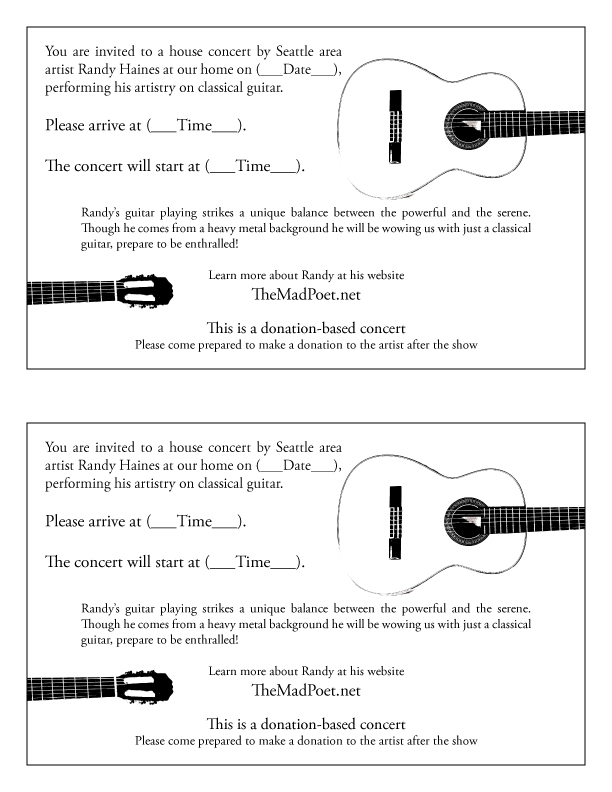 We highly recommed a house concert with Randy. Your friends will love it.